We all love the extravagant hairstyles of the catwalks, but would like them in a more wearable form that fits to our daily lives. Robert Ari did just that. He took his inspiration from the international fashion hubs and mixed it with tendencies he already saw on the streets. 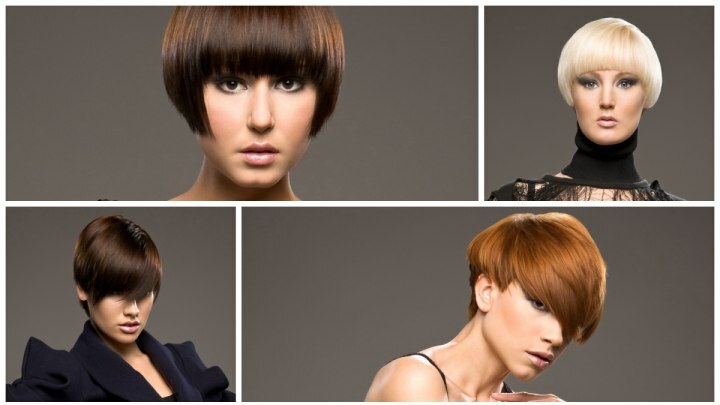 The result is a chic collection of short haircuts, each sleek and shiny, but with a unique shape and expression. Round and barely longer than the ear lobes, equipped with strong bangs and either straight or overlapping styling the four looks present their shiny surfaces in the basic colors or red, blonde and brown. A sporty short haircut with a trendy styling is the recipe for low maintenance but maximum effect. The graduated back keeps the neck cool. Longer hair on top allows for many fun styling options and in this case it is styled with a dynamic swing forward. The long fringe is dense and shows an interesting pattern through the different directions the hair was given. It leaves just enough room for the eye to peek through. The color is a warm orange- brown that has a golden glow to it. 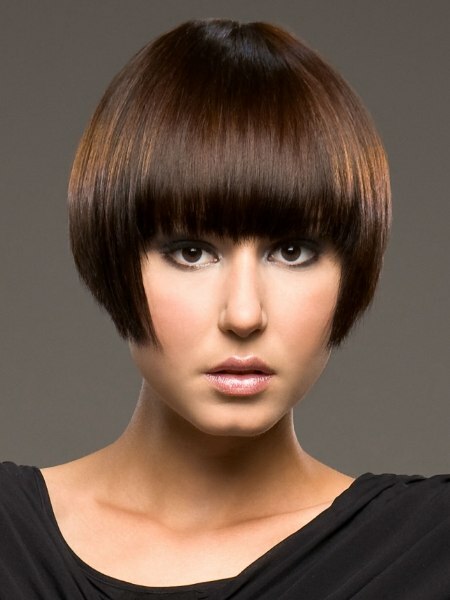 Every aspect of this refined short haircut is round - the overall shape, the sides and the fringe. To counteract too much symmetry the direction of the hair, as it flows across the crown, is diagonal with its anchor point towards the side. A fresh blonde with accents in platinum and rose completes the ethereal glamour of this iconic style. A few longer strands disrupt the even lines of the gamine cut that is the base to this short modern haircut. One of them leaves a striking impression as it runs diagonally across the eyelash long fringe, others create fine points accentuating each cheekbone. The hair color is a fine, polished chestnut with much depth and dimension through some very gentle and fine highlights. Similar to the blonde style before this haircut bets on the charm of roundness. 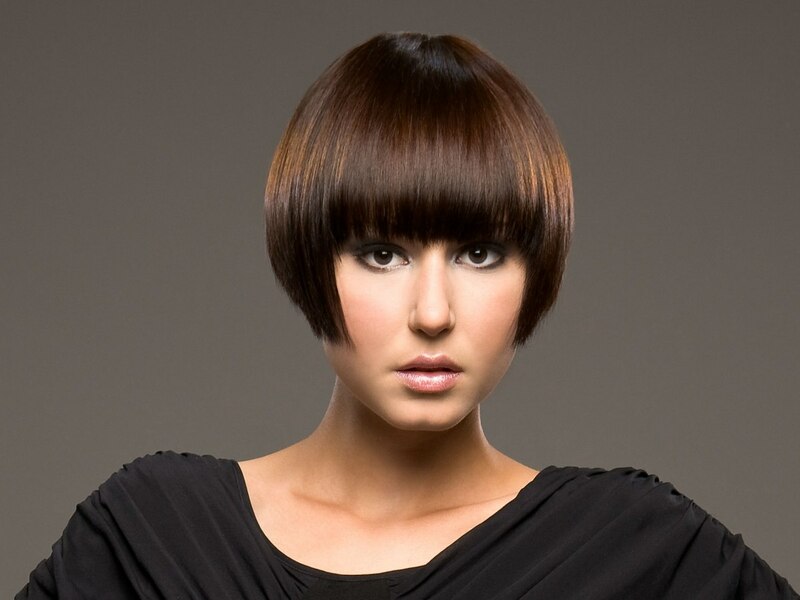 This short bob is shaped to a perfect oval and to break up the uniformity some texturing was added to the edge of the long fringe and sunset colored highlights illuminate the brown base color. 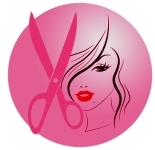 The hair is cut right below the ear level in a straight line all around and a flattering corner is styled to bring attention to the cheekbones.